My inspiration for taking action about our environment was the former president of Costa Rica, his excellency Jose Maria Figueres-Olsen. Through him I first came to understand abut Sustainability and how it relates to human, environmental and economic development. Sustainability means "meeting the needs of the present without compromising the ability of future generations to meet their own needs." I met him when he came to the American University of Kuwait to speak about the escalating dilemma of climate change and its effects on our environment today and into the future. I had known about the former president before this being from Central America myself. 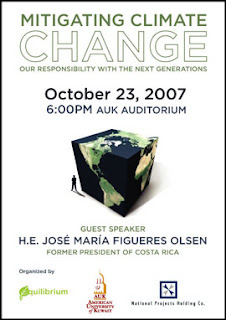 I knew he had accomplished so much in his young life and had been dedicated to gearing Costa Rica, and in many ways the rest of Latin America, towards sustainable development through policy making that includes strategic investments in social areas and the developing of environmental policies. It is exciting that even in less wealthy countries this issue can be addressed, so imagine what the more wealthy countries can do? This is where social responsibility comes in, but that is a topic I will save for a later post. At any rate, he is a very down-to-earth and un-assuming person. He smoothly slipped through the crowd into the auditorium, but I recognized him immediately. I greeted him in Arabic with Salam Alaikom. He responded "wa alaikom salam!" I then asked him how he is in Spanish and he was surprised to find an Spanish-speaking student. I explained to him that I am from Guatemala and we had a nice conversation. His speech was amazing. He had the entire audience mesmorized for almost two hours with the topic and his undeniable passion, wit and charm. He explained how the environmental problems can find roots in the failure of government to implement and follow through on policies to address them. He stated that it is crucial to elect representatives in government who are at least environmentally aware and able to invest in protecting the environment proactively. A leader should focus not only on foreign relations, which need development in Kuwait, but also on domestic issues and use influence and power to make change from within, such as including environment policy as part of the National agenda. The UN Secretary General said; "No longer was it hoped, would environmental protection be regarded as a luxury or afterthought. Rather, environmental factors would be integrated with economic and social issues and become a central part of the policy making process." If you might have noticed, in the corner of the poster advertising the ex-president's speech, there is a little green logo titled, "Equilibrium." This is also how I first learned about Equilibrium, the company I am now interning for.